Had some friends over last week and much Guitar Hero 2 was played. 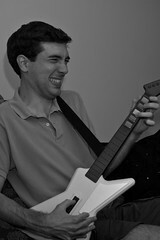 A great game, but I realized how much my rock chops need work before the release of Rock Band on Nov. 6th. That is unless others want to help storm into the Central Square office of Harmonix and play it early? I’ve commited to myself to waking up at the crack of noon, practice shredding on “Carry On Wayward Son” and watching Rock of Love for tips on rocking and dealing with groupies, even though Bret Michaels was Poison’s singer. Speaking of which, is anyone going to sing for Rock Band? I’m can see the attraction in guitar and drums, and unless I improve I’ll be on bass. Maybe Craigslist could turn up a Rock Band singer, or maybe the drummer will have aspirations?